Elephant and Castle started off as two villages called Walworth and Newington. Walworth began as an affluent suburb however it was taken over by slums in the 18th century due to an increase in population and the moving of the middle classes, causing a demand in housing that still persists today. However from the 1890s, the area became a place of leisure and excitement for not only locals of the area, but also to people that were living outside, made attractive by the alternative entertainment available such as the theatre. Unfortunately, the area changed in the 1940s when the number of slums continued to increase, due to the continuous growing population.The issues of rehousing and class change are as ever present today. The contribution of the Latin American community of Elephant and Castle to the estate is of great value and much credit and also the history of the development from the 19th Century and this must be reflected upon in regeneration. Although the area has been through a redevelopment stage in its history, the issue of the simultaneous increase in population was never fully tackled. If it had been alleviated earlier, Elephant and Castle would have been an improved area. It has been identified as one of the areas in London which needs to go through the regeneration process as great potential is seen in it, and is a suitable area for introducing sustainable methods due to its history and need for change. More recent developments in sustainability and technology have helped in a more promising future for Elephant and Castle. But the possible hidden reason behind wanting to rebuild the area needs to be addressed. It could be that the high crime rates are being used as an excuse to rebuild the area all over again. The embodied energy within the 1960’s concrete buildings and the energy needed to remove it illustrates that a tabula rasa may not be the most efficient or constructive approach. As part of the regeneration process Lend Lease has developed a number of green spaces that will not only be a great way to connect people of the community, but it also plays a great part in cleaning the environment of the high CO2 emissions. The green spaces include a new 2 acre park and 1200 new trees being planted in the park, and around streets, schools and estates. Also included are a two pocket parks and a community garden. All this will increase the biodiversity of the area through a range of plant and animal species, all working in their own niche to keep the ground space and air clean. Regeneration of Elephant and Castle includes cleverly thought out ways to make the space more accessible for pedestrians and for cyclists. One of the most focused on areas in Elephant and Castle so far is the Heygate Estate. Over half of this area includes publically accessible space which improve connections throughout the area. This will all be built around 235 new homes, covering 1.1 hectares of land. Resilient designs anticipate future disturbances. Resilience means to design something accordance to what may happen in the future and although on most occasions when it is mentioned, people mean against extreme disasters such as flooding and earthquakes. However, the designers for the regeneration of Elephant and Castle have had to focus on the problem of the ever changing climate of London. Being an extremely busy city with an increasing pollution problem, higher CO2 levels are in the atmosphere, so designers have responded by creating more bicycle routes, encouraging their use more, and decreasing the use of cars. The apartment blocks have been designed with cycle spaces and there have been a total of 3000 cycle spaces available in the area altogether. Another way buildings have been made greener are by the addition of recycling bins and compost bins to encourage people to make the area healthier, and hopefully maintain this care of the planet in the future. Resilience against speedy increase of storm Island effect is to be dealt with by creating green roofs and brown roofs. An aim is set to have 30-50% of the new buildings having these. Aspects of this project can be applied to any city, town or area going through regeneration, or even if they are trying to introduce little project such as small, healthy public spaces. Accessibility to green spaces is a huge factor to encourage people to use them. The level of access to an area makes it more welcoming. It allows one to feel like the space was created for all people to enjoy and not made for a certain person or group of people (access from a poorer area to a park is just as important as access from a wealthier area to the same park). Increased accessibility means an increase in the economic and social degree of sustainability in an area, allowing the space to reach its maximum potential which designers set out to do. Designs must be thought up which will encourage people to interact more with the sites. Not to just see a place, but to touch it as well. Man has become increasingly disconnected with the environment so regenerative designs have to be well thought which will make us want to be outside again, and the connection will soon develop into a love for the outdoors and open space, encouraging people to look after their surroundings by doing simple things such as recycling or even using bikes instead of cars. This could reduce the need for such emphasis, effort and money placed on advertising. Seeing firsthand what can be achieved such as the small cosy pocket parks and the larger green spaces can in itself change people if they see what they can reserve. The project so far and the plans put forward for Elephant and Castle, are part of the push towards a more sustainable and eco-encouraging city. Strata SE1’s aims of sustainability are manifested very explicitly in its technical specification but it also attempts to resolve the social aspect of sustainability secondarily. 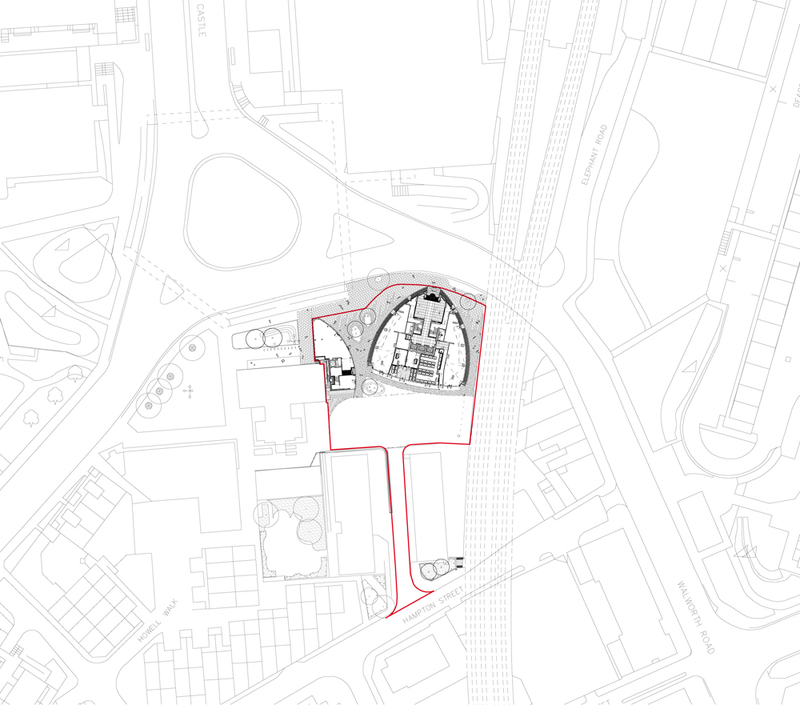 Out of 408 apartments, 20 have been offered to residents of the neighbouring Heygate. Furthermore, 25% of the flats are affordable homes and thus it attempts to cater for a spectrum of different social circumstances and reconciles the displacement of local residences to a minor degree. On closer inspection, the affordability of these homes can be questioned as the official definition of the word ‘affordable’ was recently altered, effectively raising rents in affected housing by up to 300%. A product of this is indicated in that only six residences of the Heygate Estate have actually relocated to Strata, illustrating that the initiative has generally failed in providing adequate housing it had planned to. 75% of the apartments were bought off-plan, before construction, by investors therefore the scheme can be seen as a vehicle of speculative property market profiteering instead. Top-down regeneration may succeed if local jobs are provided and a diversity of housing is offered but gentrification is typically produced as later developed upon. All flats have floor-to-ceiling windows so there is no apparent hierarchy in relation to the quality of internal spaces. Conversely, there is an explicit hierarchy of wealth in the Strata’s arrangement. Residences rehoused from the Heygate Estate live in the Esprit Apartments, a five storey pavilion detached from the tower. The affordable homes exist on floors two to ten within the tower moreover. The penthouse apartments are worth £2.5 million with their views of London. Glancey likens the tower to an old-fashioned transatlantic liner with its complement of first-, second-and third-class passengers and Olcayto indicates the class divide imposed by Section 106. Therefore, although Strata attempts to diffuse social differences, it does not do so to the fullest degree. It is imbalanced to wholly criticise the scheme in its social agenda. It must be considered that Castle House, the building that had occupied the site on which Strata stands was wholly commercial and therefore it has not itself displaced any residences in the redevelopment. Instead it has alleviated the rehousing of people from the neighbouring council estates. Thus it has some justification in not being a more socially conscious model. Furthermore, Strata is only one scheme in a £1.5 billion regeneration, consequently, many other initiatives may resolve the shortfalls of Strata’s design. The addition of the affordable housing can be seen as a way of filling quotas set by Southwalk Council and it is apparent that the environmental aspect of the sustainability triangle takes centre stage to the social one. Strata can be firmly placed into the eco-technic sphere in Guy’s categorization of sustainability in that emphasis is placed on the performance of the fans in its promotional material over its reconciliation of social problems within the area. The scheme could have been sustainably richer by learning from more eco-social schemes in being more local in its approach and by providing more participation in its design. It is a barometer for further redevelopment in Elephant and Castle and thus it must be inspiring in as many aspects of sustainability as possible. Many within the community of Elephant and Castle believe that its regeneration would lead to gentrification and the poor provision of social housing in Strata has caused these concerns. Liberal Democrat MP, Simon Hughes, asks that the council withdraw planning application for the redevelopment of the Heygate Estate due to the fact that the scheme is not adequate in providing affordable housing as only eight out of 1,000 are council rent prices. The Charter for Community Inclusion and a Better Quality of Life for All, written by the Elephant Amenity Network, a coalition of local groups, indicates further fears. It is believed that the current Latin community will be lost due to the fact that housing prices and living prices will increase as richer citizens inhabit the area whilst poorer are forced to move out. These fears are not without plausibility if all projects do replicate Strata, as its most expensive apartments are valued at £2.5 million and thus have considerably elevated the top bracket of local property values. Furthermore, the council has accepted a project that will not be offering any ‘affordable housing’ in what a spokesman for Southwark Council described as ‘an exception to normal policy, setting a precarious precedent for sustainable housing and justifying much distrust of the redevelopment. Although Strata did not overlay housing, it did remove the jobs that were provided by Castle House. Two commercial units exist within Strata but adequate employment opportunities must arise elsewhere within the masterplan in order to resolve this displacement. It is dangerous to only consider the prominent opinions found in the press that the Heygate Estate is a sink estate as many residences praise the generous sized homes and ample green space and these voices must be heard. Ex-director of CABE, Sarah Gaventa, has been appointed chair of the Elephant and Castle regeneration forum. This is encouraging for a more nuanced approach to the project as more democracy and participation may come to fruition. It is too early to criticise the sustainability of the redevelopment as very little has been completed and many of the locals concerns are speculative. The development of Strata SE1 is, to a large extent, a role model for a more eco-conscious society. It will catalyse the urban regeneration of Elephant and Castle and the implementation of wind turbines on a building’s structure. The project is incredibly technically centric in its promotional material and therefore is able to be a model applied globally, as is illustrated by many eco-technic leaning projects. However, this means that sensitivity towards local needs are absent. It can be seen that Elephant and Castle council are demanding a tabula rasa in order to resolve issues within the area. Although this may alleviate the crime caused by the poor layouts of the 1960s post-war council housing, it may displace many inhabitants as social housing quotas have not been fulfilled thus far. Furthermore, the implications in terms of the embodied energy contained within the previous council houses needs to be addressed. Although there is promise of new parks and community spaces, much of the redevelopment puts existing green environments under threat as raised by local groups. These groups must be heard in order to produce a more nuanced approach to sustainability and this was neglected in Strata SE1. Strata can be criticised for its insular appearance and the hierarchy of residences within its layout. Furthermore, the complaint of its aesthetic via its winning of the Carbuncle Award may impede green thinking through its ugliness. On the other hand, it must be remembered that Strata can be seen a prototype for a green future, and it is noble in this regard. Radical schemes like this must be built in order to further society for sustainable technologies that work effectively. If Strata were to combine this technocratic approach with an approach that had the concerns of local people addressed, it would have tended further towards sustainability. All of this praise and criticism must be handled with caution as Strata is incredibly new and thus statistics on its effectiveness is harnessing wind are inadequate. Furthermore, much of the regeneration has not been built and thus many people’s concerns are speculative. Time will give the ability to see the true sustainable implications of Strata SE1 and the development of Elephant and Castle. 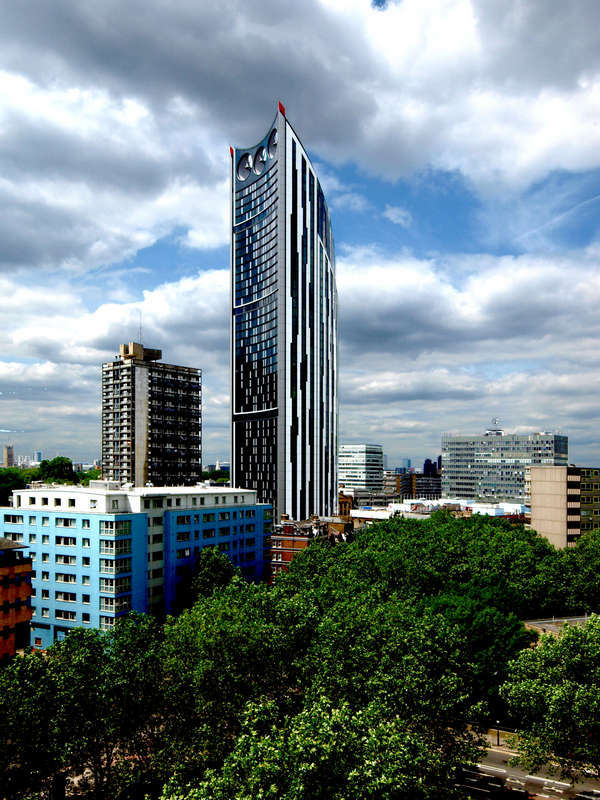 The construction of Strata SE1 is initiated the redevelopment scheme in Elephant and Castle, South London, scheduled to take place over the next decade and will be completed by 2020. It will involve the demolition of most of the widely unpopular post-war housing in the area, along with the drab shopping centre, and the creation of new public spaces and parks. The proposed transformation is projected to cost £1.5 billion and will include more than 5000 new homes, along with landmark commercial developments. Strata SE1 is formed by two buildings: the tower itself and a five-storey pavilion building which is located just next to the busy Walworth Road and railway viaduct. They replace Castle House, a 1960s five-storey concrete office block, which incidentally formed the first building of the former Elephant and Castle redevelopment. The tower, covering a floor area of approximately 30, 000 metre squared, contains 408 apartments. There are two further commercial units on the ground floor of the neighbouring five-storey pavilion building, with three storeys of shared ownership apartments and one storey of plant rooms. A small basement joins the two buildings and contains car and bicycle parking and plant rooms. The apartments themselves have open plan kitchens, which were achieved through the use of fire engineering analysis and apartment sprinkler systems. Evacuation is planned to be phased, relying on a single escape stair. The tower offers proximity to the City and thus is in a desirable location in which to live. In order to give the sense of arrival, the main entrance of the building looks towards the city and sets back from the main pedestrian walkway. Meanwhile, the double-height lobby reduces the scale, consequently linking the alternation from public to private space. Inside the building, in place of narrow corridors, mini atria offer generous space and light. There are four lifts within the tower: one central lift serves the affordable accommodation only, two high-speed lifts each side serve the basement to level 38 and one high-rise shuttle lift serves levels 38 to 41 in the same central shaft as the low-rise lift. Wind power is one of the fastest growing energy technologies in the world. It has been demonstrated commercially over a wide range of geographical conditions, the UK is particularly well placed to exploit it. Sufficient wind is available in the UK to power turbines for about 85 per cent of the year, making the UK one of the best places in Europe for wind power. Concern over the environmental impact of the land-based wind farms has encouraged the development of offshore facilities, especially in the urban area. The UK government wants half of the 3500 planned wind turbines over the next decade to be erected offshore and half on land. London Array is a successful example in this wind power application in a large, densely populated space. Looking towards this, Strata SE1 aims to be a successful icon in applying wind power on the building itself, helping build a secure energy future for the London. The Strata SE1 project team was set the challenging task of designing and delivering an economic and attractive tall building while also delivering the sustainability goals of the local council. A number of options for achieving the mayor’s 10% renewable energy target were examined at the concept design stage and the design team and client concluded that wind turbines represented the best solution given the size and shape of the building, while demonstrating a visible commitment to sustainability. The three nine meters five-bladed wind turbines are expected to produce 50 Mwh of electrical power per year, which is approximately 8% of the building’s total energy consumption. 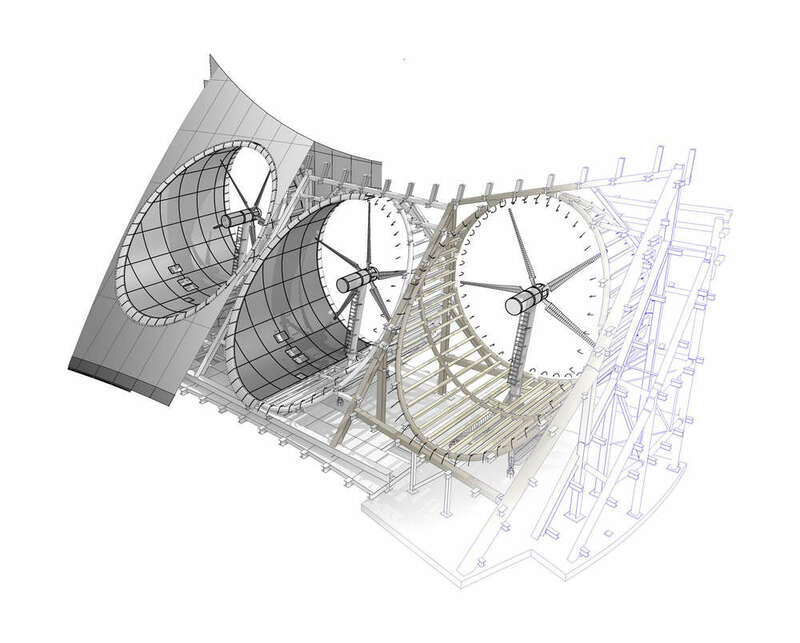 Each turbine can produce maximum 19 kW of power output, to generate more electricity, the wind turbines are connected to a gearbox that can converts the blade’s relatively slow rotation into high-speed rotation. Also, the tower has been designed to be a triangular form with the three wind turbines facing southwest, the predominant wind direction for London; this can maximize the benefits of the wind power. However, it can be argued that placing emphasis on these turbines is not justified in relation to the benefits gained. The three wind turbines cost an extra £1.5million in total, but can only produce a maximum of 8% of energy of the building needs. With these resources, the designers could have designed something that exceeded these targets. The energy collected from the wind turbines will be collected by Elephant and Castle Multi Utility Services Company. Through this company, the energy collected from the Strata Tower will serve 5000 homes in the area around as well as the tower itself and thus attempts to provide green solutions to other buildings in an integrated approach. With the height of the tower and the flat topography of London, the generation of wind power, in theory, should be very high, but the wind speed and its direction vary greatly with time; it cannot be used as a source of energy in isolation due to this unreliability. Therefore, on the face value, the turbines seem like a viable solution but come with issues that impede goals towards sustainability. 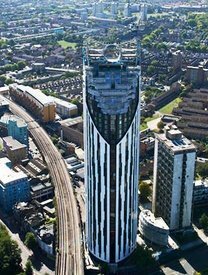 Furthermore, the tower has won the Carbuncle Cup Award by Building Design in 2010, for being the most unattractive building in the country. It has been stated that it looks like lipstick, an electric razor, and “a cheap plastic lady’s electric shaver which has been scaled up 1,000 times and dumped on the site”. Other sustainable features with Strata include a heat recovery ventilation system, low energy lighting, and a high performance facade with an air permeability leakage rate 50% better than the building regulation. 96% of the waste materials generated during the construction process was recycled. In addition, provision has been made for connection into the proposed local community combined heat and power system, resulting in further reductions in carbon dioxide emissions. Altogether, it is anticipated that this will result in a 73.5% reduction in carbon dioxide emissions compared the 2006 building regulations for England and Wales. The mechanical systems include centralised boilers with heat metering to each apartment and grey water recycling. The electrical systems include fibre-optic cabling to each apartment and a display showing the wind turbine power output and carbon dioxide emission reductions. Strata can be seen as an experimental icon that aims to promote the sustainable living and the regeneration of Elephant and Castle over being sustainable itself. The experimental nature is illustrated by Matthew Hewitt, Strata’s project director, “we think it will work, but we don’t know.” So it may be excused in its poorer performance than anticipated if it inspires society to produce more effective strategies in the future. Urban 75 blog. (2011). The rarely spinning turbines of the Strata Tower, South London. 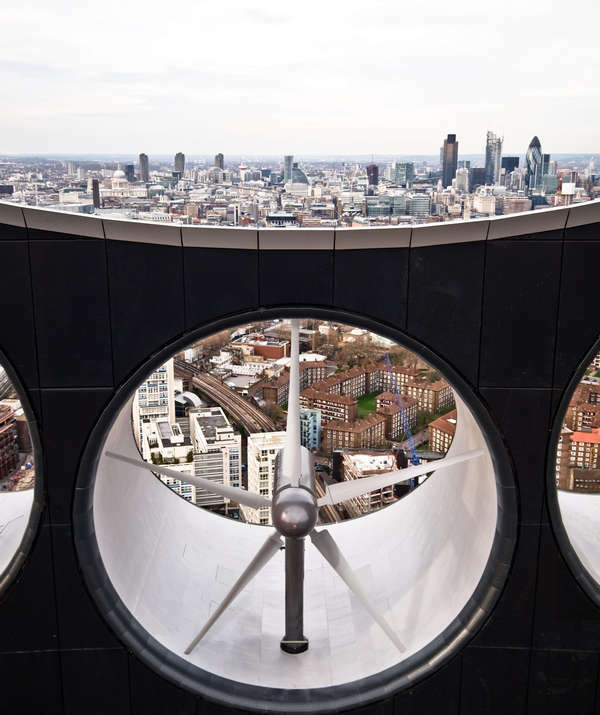 [Online] http://www.urban75.org/blog/the-rarely-spinning-turbines-of-the-strata-tower-south-london/. Urban 75 blog. (2011). The rarely spinning turbines of the Strata Tower, South London. 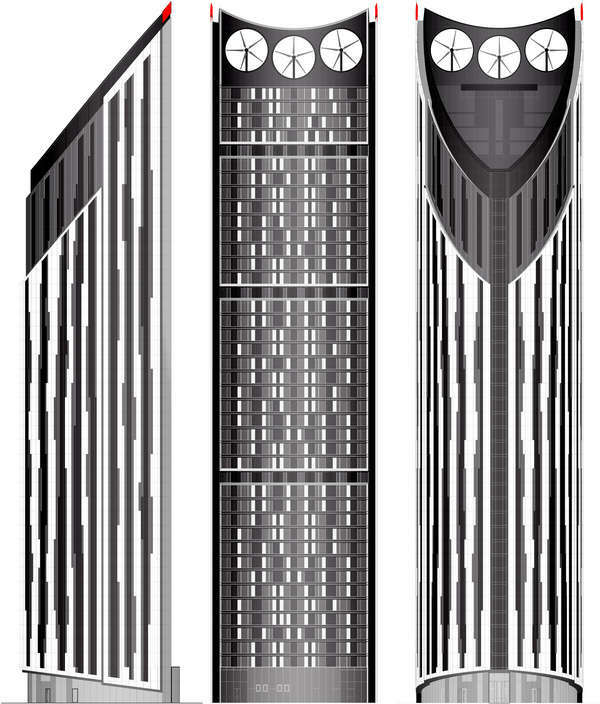 [Online] http://www.urban75.org/blog/the-rarely-spinning-turbines-of-the-strata-tower-south-london/. Martin, E. (2010). Residents hit boiling point at the eco tower where turbines don’t turn. [Online] http://www.standard.co.uk/news/residents-hit-boiling-point-at-the-eco-tower-where-turbines-dont-turn-6503753.html. Aitch, I. Are these the world’s ugliest buildings?. [Online] http://travel.malaysia.msn.com/photogallery.aspx?cp-documentid=4996673&page=1. Lucy Alexander. (2010). Tower of power hits the height; London special A Pringles tube or symbol of hope? The Strata project could be the making of one of the capital’s most deprived areas, says Lucy Alexander. The Times (London, England) . p6.